The US as an ‘idea’ is dying. The country that used to pride itself on free speech, democracy, and being ‘the last remaining superpower’, is now apparently drunk on its own power. With unchecked powers expanding at every turn, and terror laden missives booming out from government departments, the country seems to be taking a counterbalancing position from those who embraced freedom in the Arab Spring of last year, and is actively cracking down on freedoms previously embraced as a national advert. Over the last ten years, the answer has turned into a resounding NO! Over the last ten years there have been many laws passed ostensibly about ‘fighting terrorism’, but which boil down to naked fear. A fear from the populace that some nebulous ‘terrorist attack’ will kill them all (despite the fact you’re more than 70x more likely to be just plain ‘murdered’ and 150x more likely to die on America’s increasingly poor quality roads than be present at a terrorist attack) which has supported a government that is increasingly spineless and cowardly. Nowhere is that more apparent than in the many instances over the last few months involving the uses of the police, when it comes to the First Amendment. There have been many well documented clashes between police and the various ‘Occupy’ camps around the country in the last few months. Police officers have on occasion responded with excessive violence and weapons that did not fit the situation. In those instances, video recordings have made it clear what has happened, and often contradicted police reports and claims. Yet, as was pointed out a few months ago, there’s usually very little in the way of repercussions when police officers break the law. Take for instance Joe Arpaio. 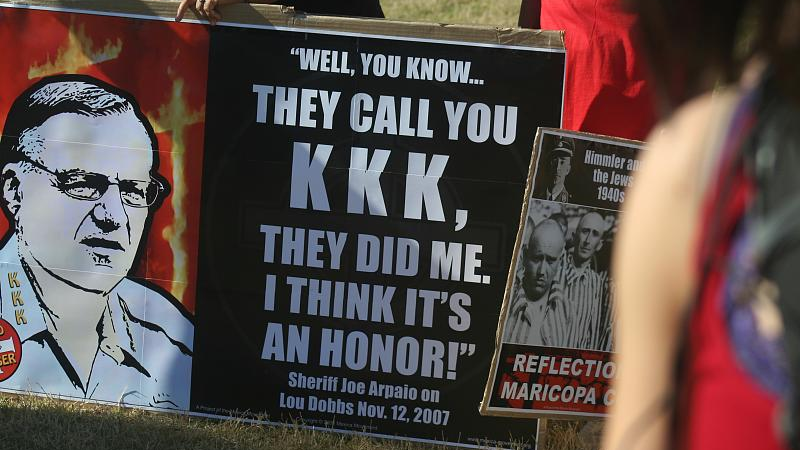 The self-described ‘toughest sheriff in America’ is no stranger to controversy. There have been a number of wrongful death cases which his department has lost, his central jail lost a lawsuit about unconstitutional conditions in 2008, and the verdict was reaffirmed in 2010 when he still hadn’t improved them. He was feeding inmates bad food (commonly known as ‘poisoning’) and was broadcasting video footage of in-processing after arrests to the web, prejudicing trials (otherwise known as perverting the course of justice) and because of general misconduct, his whole department had their ability to enforce Federal Immigration law stripped by the Department of Homeland Security (and I remind you, that’s the same department that has no problems with sexually abusing 6yo’s in the name of ‘security’, so you KNOW it’s bad) which was why Arizona passed SB 1070 – the ‘papers please’ law. He’s also under investigation for witness, voter and candidate intimidation, harassment of newspapers, and for ignoring serious sexual assault cases. So has he been punished in any way? No, of course not. As Sheriff, he is almost untouchable. It seems that both police officers and politicians have an allergic reaction to video cameras being pointed at them by the public. A search on YouTube will return LOTS of videos of police officers reacting ‘badly’ to being videotaped. Often the argument put forward by the police is that people are interfering in their work by videoing them. In other states, with two-party consent for audio-recording where there’s an expectation of privacy, police officers going about their duty have arrested people for wiretapping, a felony which often carries 5-10 year prison terms just so you’re aware, recording video is ok, recording audio is the no-no. Generally when these cases are made public, some prosecutors back down, but some stick at it. Almost inevitably the courts decide that no law was broken, because there was no expectation of privacy at the time of filming. Thankfully MOST courts are standing behind citizens and saying clearly that recording police officers in the course of their duties is NOT wiretapping, or a felony, but is in fact a protected 1st Amendment Activity. Yet that doesn’t always stop the police. In Pennsylvania, despite rulings that it’s legal going back to 1989, police there will sometimes arrest for ‘wiretapping’, with documented cases as recently as 2007, and still no adequate recourse for the victims of officers acting outside the law. The occupy movement has also brought another spotlight onto the First Amendment. The ability to petition the government and protest is the less well known side of it, but it’s there. However, the ability to do so has been severely curtailed in recent years, from the ‘free speech zones’ created during the Bush era (and later copied by the likes of China) to the storm-trooper raids on the Occupy camps. The arrests and intimidations of the police against media attempting to cover the camps, and the police actions against them are further attacks on the first amendment. In fact, the US has dropped a significant number of places down the current Reporters Without Borders Press Freedom Index, from 20th to 47th, because of this. NYPD’s Deputy Inspector Bologna, and UC Davis Police’s Lt. John Pike are now symbols on the net of excessive violence. And their punishment? Bologna has been reassigned to Staten Island, and Pike has been on ‘Administrative leave’ (with pay, which was $110,000/year in 2010). Oakland, which also made a splash with video of a young ex-Marine getting shot in the head and then pelted with flash-bangs is already in trouble. They’ve been under court orders to improve their behavior for almost ten years now (after a gang of police officers called the Rough Riders were planting evidence, using excessive violence and falsifying police reports) and have been given a March ultimatum, or else the city will have control of its police force taken from it. It’s a step that should have been taken 5 years ago, when Oakland PD failed the original order, yet unlike any normal person that had failed a court order, they were not disciplined, but let slide for another 5 years. Politicians are also getting in on the act. One of the more unusual stories this week was the arrest of a documentarian from a US Congress committee hearing. The hearing, on fracking, was going to be recorded by Josh Fox, (who has already produced one documentary on the topic, the Oscar Nominated Gasland) as well as credentialed ABC news reporters. The Republican chair of the House Subcommittee on Energy and Environment, Andy Harris (R-Md. ), directed Capitol Police to arrest him for ‘unlawful entry’. The issue there was not so much one of ‘not wanting to be filmed’, as the cable-funded C-SPAN network was filming the hearing, but an attempt to deny Fox the ability to have his own high-quality shots for a follow-up documentary. In undertaking his actions on February 1st, Rep. Harris violated his oath of office, by actively acting against the First Amendment. So what’s the consequence of that? The same consequences as when Joe Arparo violated the 4th, 5th, 6th, and 8th amendments, as when Pike and Bologna attacked protesters, using chemical weapons on people exercising their 1st Amendment rights. Nothing. The serious issue is, there’s no accountability – no respect for the law – by those whose job is to write the law or enforce it. This goes for former members of Congress who have turned into lobbyists as well, demonstrated by Chris Dodd’s blatant admission of bribery when SOPA lost its support. One North Carolina State Rep, Larry G. Pittman, made news last week for suggesting public hanging should be brought back to increase the deterrence of murder (and he included abortionists there, making him part of the ironically named ‘pro-life movement, better characterised as anti-choice), and that appeals should be filed all at once. Given the often questionable nature of US Capital convictions, it’s rather disturbing. Especially as violations of what is deemed the country’s HIGHEST law, the Constitution, are rarely punished at all. Funnily enough, there are laws specifically to deal with it. Perhaps hanging, with only one appeal, would deter people from violating the country’s highest tenets, not that it will happen. Those that wield the power rarely feel the need to submit to the rules they lay on everyone else. And that’s the REAL problem. Until that problem is fixed, the Constitution is just a piece of paper. This article is so horrible that it is hard to relate to it or comment. I expected 200 comments but assume that people are just paralyzed and just can’t say or add anything. PS. Try to get the article published elsewhere. Politics & P2P | Is it Time to Police the Police?